inspiration: Poussins en Cocotte "Bonne Femme"
I could hardly breathe because of the deliciousness wafting up from the kitchen. And then it just got better and better! Yes, indeed, just as I was beginning to wonder if I was going to bother renewing my subscription to SAVEUR magazine (I’m still chafing a little at what happened in December), we noticed this recipe in SAVEUR No. 92 from April 2006. It turns out there’s a good reason to keep back issues of SAVEUR in the bathroom…. I’ve been going to Le Veau d’Or ever since my father first took me there when I as a college undergraduate, in the early 1960s. 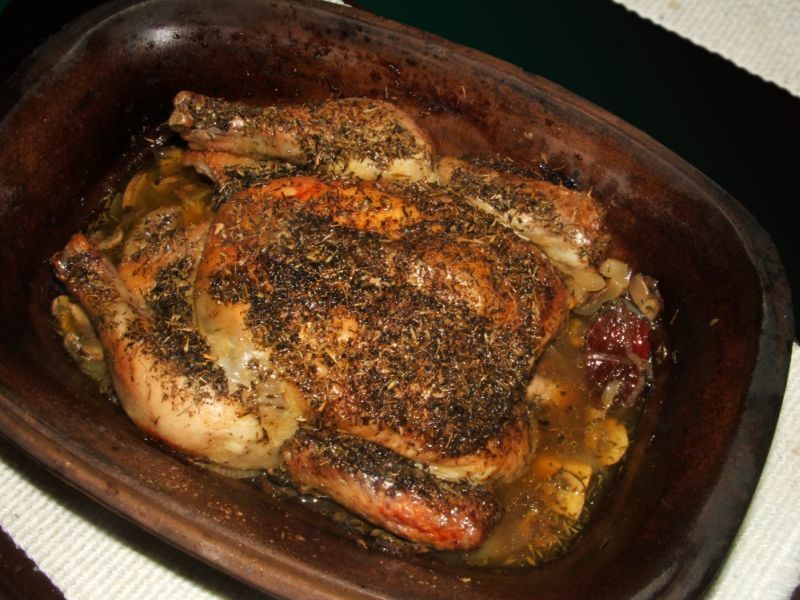 Over the years, I’ve eaten the luscious poussin en cocotte “bonne femme” […] more times that I can count. […] Most likely the restaurant will remain for some time exactly what it has been for nearly seven decades: a patently identifiable, perennial French sanctuary of comfort and conversation, quietly aberrant behavior, and intelligent cuisine that will still be around when all the vegetable froths and crudo conceits are long gone. We thought Poussin en Cocotte “Bonne Femme” would be very similar to Coq au Vin, but the white wine makes it quite a bit different. We used an Argentinian chenin-chardonnay – for drinking, a little on the soft and strangely sweet side (even though it is supposedly dry) but perfect for cooking. Rather than going in search of poussins, we decided to get a smallish (~ 3 lbs) free-run chicken. In place of beef stock and shallots, we used vegetable stock and regular cooking onions. And instead of using white mushrooms, we sprang for lovely little brown cremini mushrooms. We forgot to get bacon…. Sigh. This is why one should always take a list to the store! But. I cannot imagine that this wonderful chicken could taste any better than it did! We served it with green beans and lightly buttered steamed potatoes – if we’d had any parsley, we’d have added a little chopped parsley. SAVEUR translates this as “Spring Chickens with Bacon and Mushroom Sauce”. How dull that the English translation is so far off the mark and simply describes the ingredients. I’d translate it as “‘Good Wife’ Spring Chicken Casserole” because, with the absence of cream, it can’t really be called “Bonne Femme” sauce…. bonne femme [bawn fam] adjective French Cookery. prepared in simple style, as in a cream sauce containing mushrooms: fillet of sole bonne femme. Please note that we didn’t exactly follow SAVEUR’s instructions. We put the sliced onions, mushrooms, white wine and vegetable stock into our pre-soaked clay pot and then placed the chicken, slathered with thyme, on top of the vegetables and roasted it until the chicken was done. We then removed the lid, drained the sauce into a frying pan and put the chicken back in the oven for about 10 minutes to brown. We put the sauce onto the stove to reduce somewhat. Today, we made stock with the bones and are going to add the leftover chicken to it to make chicken with rice soup. Judging from the smell of the stock bubbling ever so gently on the back of the stove, we will be in heaven again tonight. To add to our joy, I’m pleased to report that the forsythia is finally blooming in the garden. The chives and garlic are sprouting; the crocusses popped out yesterday and there are tiny green leaves and miniature flower buds all over the lilac bush by the kitchen window. Life really does continue to get better and better! edit 9 May 2014: When my dad used to come to Toronto on business, he’d call ahead to tell me to make reservations for us to have a splash-out dinner together. He always said to make the reservation for 7pm. We’d arrive and because I always explained for the reservation that my dad was taking me to dinner, the staff would make a huge fuss of us. And as we ordered dish after dish and took eons to choose the right bottle of wine and lingered over our many delectable courses, talking and laughing about nothing at all, more and more staff would drift by to say smile and say hello and be thrilled that we were thrilled by everything they had to offer. Naturally, we always had dessert. Actually, Dad always had two desserts. I was more discreet and confined myself to one. At last, we’d notice that we were the only ones left in the restaurant and get up from the table at around 10:30 or so, a little whoozy from so much cream sauce and back I would waddle, carrying my stomach, to take the subway home to my little apartment. I would phone Dad when I got home and we would both say simultaneously, “Why did you let me eat so much? !” And then the next time Dad came here on business, we’d do exactly the same thing again. Dad would have LOVED Le Veau d’Or. What fun we would have had! This entry was posted in 'Saveur' Magazine review, cookbooks, etc., food & drink, main course on Tuesday, 6 May 2014 by ejm. Oh, my, that looks amazing! My chicken is thawing right now! Thanks for posting. Wish my computer had a smell factor…bet it was the best! Since I think that anything with bacon is better, usually, than anything without, you should try it with bacon sometime. Sounds like spring has finally sprung. YAY! Love those crocus flowers and I have a 25 year old forsythia bush that blooms every spring, early. Once those yellow flowers arrive I know that warm days are on the way. edit 19 May: Yes, one of these times, we’ll remember to try adding the bacon. But I really can’t believe it would be much better. It was fantastic as it was. Guess you’re going to be sticking with Saveur for a little longer! This sounds amazing!